Summary: By nightfall after Trump’s election we had rationalized away this astonishing event with myths, ensuring that we learn nothing from Campaign 2016, Let’s strip away these pleasing stories and confront the truth — no matter how painful. Then we can start to prepare for a better choice in 2020. Myth: Trump won the election! Myth: The polls were very wrong! Myth: The election repudiated US elites! Myth: 2016 was a victory for populism! The big lesson from Campaign 2016. (1) Myth: Trump won the election! The final counts are not in, but Clinton currently leads by over 200,000 votes (roughly 0.2%). Estimates for her actual total are well over a million votes. The Electoral College put Trump in the White House, as it did with Bush Jr. in 2000 (Gore won by 440 thousand votes, 0.5%. Like our bizarrely allocation of votes in the Senate (our version of Britain’s “rotten boroughs“), the Electoral College is a historical artifact of our governing system that has outlived its utility — but we are too lazy to fix. For more about it see this article by Scott Lemieux (Prof of Political Science, College of St. Rose) in The New Republic. (2) Myth: the polls were very wrong! Second, polls are statistical tools — not Dr. Strange’s magic spells. They should be presented with error bars showing the uncertainty of the survey. News stories about election polls and forecasts don’t have them, nor do stories about economic surveys, nor do stories about climate data and forecasts. The press want simple stories. Experts who insist about discussing uncertainty get no more calls from journalists. We’re ignorant because we read the news. Consider the uncertainties in estimating the vote from polls. Only a small fraction of people answer polls, only some of those will answer honestly, and only some of those who answer will vote. Then there are systemic challenges in any polling methodology, such as extrapolating from the sample who they call and who answers to the actual population of people who vote. The average of pre-election polls missed the actual result by 3.1% (estimated 3.3% vs. actual +0.2%). I have not found the margin of error for the major polls, let alone the average of polls, but I’ll bet that is within the 95% margins. Third, our whining about the polls is so modern American. We get the poll accuracy we pay for. Journalists could pool their money and have a few large accurate surveys. But polls are fillers between the advertisements, so each corporate media wants its own. So we get dozens of polls, none very accurate. For more about the margin of error in polls see this note by Pew Research. — Paul Campos (Prof Law, U CO-Boulder) at Lawyers, Guns, and Money.
. It is also nonsense. In 2008 we picked a candidate with almost no political record and projected our fears and dreams on him. Some Swedes joined the party, immediately awarding him the Nobel Peace Prize, while the Right proclaimed him a NAZI-communist-Jihadist-anarchist. In 2016 we did it again. We have even less knowledge of Trump’s policy goals and priorities than we did Obama’s in 2008 (most of his goals for the first 100 days are just hand-waving, lacking the months of preparation needed to make these possible). But Presidents are only avatars of our ruling elites (who run the country, and don’t have time to make speeches and kiss babies). Look at the institutions through which our rulers exert their power, not their front-men. The two parties represent factions of our elites. THE Democratic Party has been damaged. But the Republican Party now dominates our State and national governments. They have 33 governorships (the most since 1922), 56% of State House seats, and 57% of State Senate seats. Plus controlling the House (55%) and Senate (51%), and soon the Supreme Court (one seat vacant, 3 over age 75). Of these, Congress is the most powerful, as Madison explained in Federalist Papers #51 — especially when one Party controls all three branches of government. The GOP’s leaders in Congress have a well-defined agenda. Expect them to rapidly implement it, perhaps in a first 100 day surge, without waiting for Trump. I doubt he has the willpower to veto many of their bills as they land on his desk. We can only guess at Trump’s reaction to Congressional action on much of the Right’s wish list: voiding the Iran nuclear arms control agreement, either selling off cheaply vast tracts of Federal land or transferring it to the States (who will do sell it at give away prices to insiders), gutting a wide range of regulations, attacking the Fed, implementing many economic policies based on the Right’s faux economics, cutting education spending, wrecking the IRS (giving the rich and corporations greater freedom to not pay taxes), and many more bold policies to rollback the New Deal and restore the Gilded Age. What about keeping massive immigration, repealing ObamaCare (leaving the working poor uncovered), cutting the social safety net, cutting infrastructure spending, and passing new “trade” treaties (such as the TPP)? These will test Trump’s will and skills, for they are core GOP policies. The price paid for building this New America will be the fracturing (further fracturing) of America’s social cohesion. Fortunately the police and Federal agencies have been militarized, and the domestic security services greatly expanded — ready to crush opposition. Only delusional Americans could consider creating this situation a blow against our elites. The real winner from all this: East Asia, as they pass by the self-crippled America. — US elites’ strategy in Campaign 2016. Don’t elect a GOP-run government! (4) Myth: 2016 was a victory for populism! Trump ran as a populist. This brought him victory. We shall see if he governs as a populist — or as a plutocrat. I will bet on the latter, hence I list this (tentatively) as a myth. Populism is despised by America’s ruling class, and has near-zero institutional support in the Republican party or elsewhere. 2016 was a win for populism only if it produces populist actions. For example, a core tenet of populism is opposition to the power of banks. While popular on both Left and Right, America’s ruling class will fight to defend them. Does Trump have the will and skill for protracted political struggle, unlike the speech-making and carnival side-shows that are our campaigns? Does he even want to limit banks’ power? His campaign finance chairman is Goldman Sach’s alumni Steven Mnuchin (Goldman wins because they back both candidates). Rumors are that he and JP Morgan head Jamie Dimon are among the likely Treasury Secretaries. Populism! Repudiation of elites! In our dreams. Reform of America is impossible unless we build a reality-based community. — From The Histories by Cornelius Tacitus (~56 – 117 A.D.). Trump is a clown. But he was able to defeat the central leadership of both major political parties. Stronger people and more powerful groups have seen this and will draw the logical conclusion: our political structure looks unchanged, but has grown hollow. Sanders’ insurgency came so close and Trump’s succeeded. Expect 2020 to be even more interesting. Resources to help you prepare for the Trump years. Breaking the myths about Campaign 2016, so we can prepare for 2020. Clinton lost because fear failed, and her SJW’s terrified voters. Three big things to expect from the Trump era. Will Trump and conservatives inflict payback on their foes? Trump and the 1% lead America back to its past, to its roots. I recommend these articles to understand what happened on November 8. “How Democrats Killed Their Populist Soul” by Matt Stoller at The Atlantic — “In the 1970s, a new wave of post-Watergate liberals stopped fighting monopoly power. The result is an increasingly dangerous political system.” Also, “Democrats, Trump, and the Ongoing, Dangerous Refusal to Learn the Lesson of Brexit” by Glenn Greenwald at The Intercept. Politics in modern America: A users’ guide for journalists and reformers. The psychopathic leaders of America. The unspoken issue of the election: America’s descent into darkness. American politics isn’t broken. It’s working just fine for the 1%. The best response to Campaign 2016: anger. An anthropologist looks at the narrow choices we’re offered in Campaign 2016. This is quite bogus. In fact Clinton is ahead in the count by over 200,000 votes. This NYT map shows that rural areas voted for Trump. 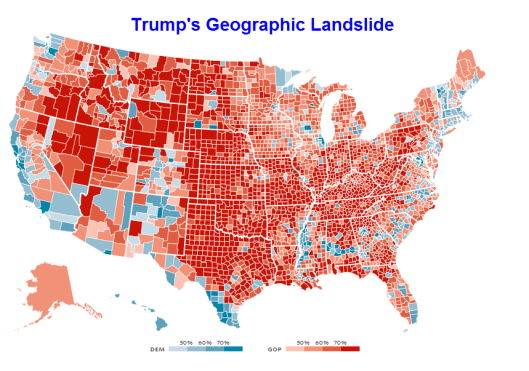 It shows a “landslide” for Trump only if land, not people, votes. I suspect that your predictions for the Trump years are not taking into account a major issue, FM. The Republican party is less united than the rest of the country these days. Mitch McConnell is said to despise Trump and Paul Ryan is probably not far behind. Trump is NOT a person who seeks to reconcile differences like Obama so futilely did. It is likely that there will be at least two Republican parties in 4 years, each calling the other RINO (Republican in name only). The mainstream Republicans (socially moderate, somewhat fiscally conservative, want slow changes) control the wheels of government and have shown great skill at keeping them out of the hands of the other factions. The Tea Party Republicans (socially conservative, fiscally slash and burn) have come to despise the mainstream Republicans for locking them out (my sympathies are with the mainstream Republicans, the Tea Party leaders tend to be scary in their complete lack of understanding of how to rule) and Trump’s primary support comes from a third, populist version of the Republican party. It is too early to say how much support the populist theme (socially very conservative, fiscally liberal) has in the new Congress. Trump could (and almost definitely will) abandon the populist wing because he is obviously going to be a one term president (age and temperament are the two obvious problems, there are probably more), so he no longer needs the populist base to govern. When we view your predictions through the lens of Republican disunity, we can safely predict tax cuts for the rich and conservative justices on the Supreme Court (although how conservative remains to be seen) but much of the rest is going to require the support of the Democrats to be passed. Congressional Republicans will still be the party of “No” because most of what you mention will offend at least one of the major Republican wings and cannot be passed without Democratic support. Most of what will actually happen in the next four years will be by Presidential mandate of an increasingly frustrated Trump as he discovers the well-hidden but very real limits of Presidential power. Time will tell which of us are correct. However, two ponts. That has not been true for years. The GOP faction in control has run Arizona, Wisconsin, and Kansas as right wing radical experiments. That’s the leadership and majority in the House, and produced most of the GOP candidates in the primaries. They want fast large-scale change. Evidence? That’s certainly not so in their elected officials at the State and national levels. (1) Mainstream Republicans still exist, for example, look at the entire Republican Senate leadership. You are right that the Republicans leading Arizona, Wisconsin, and Kansas are not Mainstream Republicans. They are Tea Party Republicans, and, as you have noted in other posts, they are not doing a very good job of improving their states economies and infrastructure but are not allowing the facts to get in the way of their leadership. A common feature of Tea Party members in my experience. Other Republican governors lead their states in different ways. For example Charlie Baker of Massachusetts is popular with both Republicans and Democrats but is definitely not in alignment with the Tea Party. The same can be said for Larry Hogan of Maryland and Rick Scott of Florida. (2) You ask for examples of disunity. In this moment of triumph, they certainly look united but at the convention in Cleveland they looked very different. Mitch McConnell was booed by the attendees. Both President Bushes refused to attend. Mitt Romney, a classic Mainstream Republican, sought to prevent Trump from becoming the nominee. Many Republicans fell off the Trump bus when the allegations of sexual harassment came out in October. Sure, they are back on the bus right now because politicians love winners and the honeymoon has barely begun but I am quite confident that they and Trump will return to form after the honeymoon period is over. Time will tell which of us is correct. I believe you are looking at the fringe the GOP and considering it “mainstream.” My guess is that by June Congress will have decisively shown you where the true mainstream is. I basically agree with you but it might take as long as August. No matter who is right, we are in for interesting times. Not as long as August. Probably March, June at the very latest. Both Trump and Congress are going for a strong first 100 days. History shows that to be the smart tactic. What they attempt and accomplish will tell us much. Politics is not like military command, FM. It takes a lot of time for the politicians to work out who is actually dominant and what can and cannot be accomplished in the next four years. Remember Obama’s first year in office where he spent the entire time trying to persuade first the Republican leadership and then individual members that there were benefits to compromise? That failed experience shaped the rest of Obama’s administration and we were much worse off because he failed. You are right that the first 100 days will be very important but they are merely the first steps down the path to a new equilibrium. There will be considerable sloshing back and forth until the equilibrium point has been reliably discovered. This is why I say August. I have no idea to what you are replying. I’m not saying that in 100 days the GOP will be finished and go home. Rather that they will follow the pattern of FDR and LBJ and do a strong push for action in the first 100 days (Trump’s team has already announced this plan), and that what they do — and what they accomplish — will tell us much about the new mainstream of the Republican Party. That’s quite false. See what was done in the first 100 days of FDR’s New Deal and LBJ’s Great Society. Even Obama, who started relatively slowly, accomplished a great deal in his first 100 days. Most Presidents do not adopt the fast dash strategy. But it works well for those that do. Just a short comment about the popular vote totals. The discrepancy will grow. California and Washington both have vast numbers of mail-in and provisional ballots that will be counted over the next few weeks. The margins for Clinton will grow in both states, but will not affect the electoral vote total. In June’s presidential primary, approximately 2.5 million ballots were not included in the initial counts. By the time votes were certified in early July, Clinton’s margin over Sanders dropped from 10% to 7%.(source). So, in the end, the vote totals will be closer to matching the national polls. Unfortunately, the changes will be in places that don’t affect the Electoral College. Thank you for that reminder! I’ll add a note about this to the post. Estimates are that the uncounted votes could push Clinton’s victory margin to over a million votes. As you note (an important point I didn’t see), that would reduce the polls’ miss to well within their 95% margin of error.